Buy, Rent or Skip Machete? 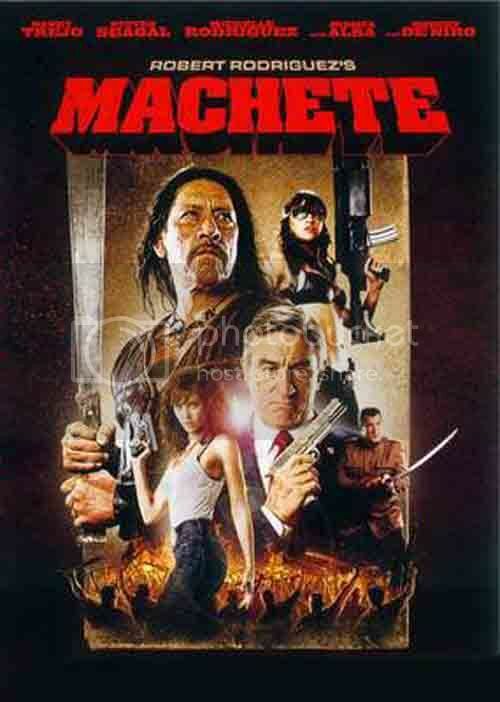 The one good thing going for Machete is that it's better than Planet Terror. But that's not saying much. I was disappointed in what the final results were for this movie. I was expecting a lot more than this. Sure, everyone goes into a Robert Rodriguez film expecting a certain style and wit. But on Machete, this just wasn't fun at all. Certainly not for me. Hey, I love El Mariachi, Desperado and Once Upon a Time in Mexico. So I knew that Machete would follow along those lines with regards to over the top gun battles and creative kills. But at least those films had something at stake or something to care about. In this one, it's just a rampaging cartoon with bad set ups and incredibly stiff and horrible dialogue. But the biggest surprise for me is just how bad Jessica Alba is in this one. If you had told me to place my bet in who would be the better actress in Machete: Jessica Alba Vs. Lindsay Lohan, I would have bet the farm on Alba as the winner. Well, that would have been a sucker bet. Sure, Lohan is hardly in this at all, but Alba does so much damage to her brand name that it's actually embarrassing. I'm a huge fan of hers...still am, but this was painful to watch. Danny Trejo does what he does best...playing Danny Trejo. No problem there. Robert De Niro, Don Johnson, Jeff Fahey, Cheech Marin and Michelle Rodriguez each did a good job for what was given them. But out of them all, the real star without a doubt is Daryl Sabara, who we all remember best as Juni from The Spy Kids flims. His role in this movie was hilarious! I don't know if it was suppose to be a gag with wink wink nod. But him speaking and acting "gangsta" had me howling. So damn funny. So what about Steven Seagal? Wasn't he funny? Yes. Yes he was. But that was unintentional. Anyway, there is plenty of blood and guts to be found in this one. So if that's your thing, you will probably like this. I still have issues with Robert deciding to go down that path of CGI blood squibs. It's just to fake for me. I liked his old school practical shooting where it was inventive. Now, it's "I will fix it in post". Sigh. But if you actually want good acting, this is one that's sure to disappoint. You've been warned. I haven't seen this since it came out but I somehow remember this NOT being a Robert Rodriguez movie, I think someone else did it but he produced it or something like that. I feel like the movie REALLY suffered by trying to stick to moments from the fake trailer so they bent themselves into an odd shape to get it all in there and I honestly think that audiences would understand if they did their own thing. It's more important to match the spirit of the thing than the letter. And I don't know about you, but Juni in this movie totally reminds me of Jamie Kennedy in "Malibu's Most Wanted." Oh, and did you happen to see the pic of Alexa Vega for Machete Kills? Rocking the Nancy Callahan outfit? I was actually looking for a cameo of Alexa in Machete since Daryl was in it. I didn't even know she was in the forthcoming sequel. Good Gawd, she insanely hot!!! I must make that a full size poster to hang on my wall!!!! Actually, that might very well be full size. She's a tiny lady. Gawd, I actually forgot that the Crazy Babysitter Twins (RR's cousins) and Doc Felix both popped up in Machete. I too was surprised at how bad Machete turned out. Both you guys make some good points. I was thinking the same thing about how they put this together for the faux trailer. It was mindless fun, but not that fun.